This is the third article in a week-long series on tween cell phone usage. In this house, we are slowly inching toward the decision to get my tween a cell phone, meaning she will join a majority of her peers. I'm leaning toward a prepaid plan to start us off. In my mind, it's like training wheels. I recognize the argument that if your child is unable to manage his/her minutes and overall phone usage, they are perhaps not ready for a phone. It's a good point, but I didn't pop my kid on a two wheel bike and expect her to ride off into the smoothly off into the sunset with nary a wobble. She started on a bike with training wheels, and we could both use some similar help in the mobile technology world. I think that her having a cell phone is a learning process, for both of us, and a prepaid plan seems like a good way for us to negotiate the learning curve. I also like that there often isn't the 2 year commitment required, so we can take try it out to determine just what our needs are or adjust if they change. So what are the prepaid options out there for tweens and their paying parents? I've gathered some info below on the range of costs for the phone, the prepaid plan costs and the available parental controls and the cost to activate them. I didn't review every company, just a random sampling. It's worth noting that Kajeet and Firefly were the only companies I checked out that offered comprehensive parental controls at no additional cost. Kajeet is phone company specifically targeting options for tweens and their parents and says it is "smart phones for kids." Phones ranged from $50-$400, with tablets also available, and plans start at $4.99/month for 10 any time minutes. They have a variety of plans to fit any parental approach. It has many parental controls and they are included in the plan price, including usage hours time manager, School Guard (which lets parents apply the school policy on digital devices to their child's phone) and contact manager. 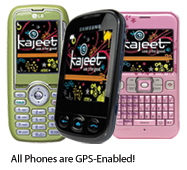 Kajeet's online parental tool kit gives parents control of the phone's usage and expenses, online or via email, 24/7. GPS locator is available for $0.99/find or for $7.99/month for unlimited locates. Firefly has the tagline "the mobile phone for mobile kids" offers pay as you go plans for $0.15/minute or monthly plans of 145 min.for $21.75 or $65 for unlimited us. Firefly offers 2 phones, both for $49.99. It also features built in parental controls that allow parents to restrict incoming and outgoing calls as well as limit or restrict texting at no additional cost. It does not offer GPS locator or tracking. Firfly does not offer online parental control management. T-Mobile offers are variety of prepaid plans, which can be found here, including $50/month unlimited, or pay as you go at $10 for 30 min. Phones range from $24.99 to $329.99. Message blocking is not available for prepaid accounts. Parental control for tweens is otherwise limitd to GPS locator costs $9.99/month. The AT&T GoPhone has options for paying by the month, day or minute. Plans start at $0.10/minute up to $50/month unlimited. Phones ranged from $18.99 to $350.99. AT&T offers free purchase blocker and content filter, but other parental controls such as time restrictions and text limits cost $4.99/month. Verizon - The prepay plans start at $50/month, and the pay as you go options include a $0.25/minute option, which is intended for infrequent callers. Phones start at $19.99. Verizon charges $4.99/month to activate the parental controls, including blocked and trusted contacts, GPS locator, usage and time restrictions. Cricket PAYGo prepaid option offered only three phones, and one as low as $30, although the pricing was difficult to tell. Plans started at $25/month for 300 minutes. Cricket offers no parental controls. Boost mobile is one of Sprint’s prepaid brands, and it offers a monthly unlimited plan. Sprint has a few options, found here under the heading "Treat your Texter-in-Training." They include pay as you go plans or pay per day, as low as $1 per day. For parental controls, Boost offers only web filtering tools for iDEN Series phones and nothing else. Hope that you find a company, plan and phone that work well for you and your tween should you decide to get a phone. If you have one that has worked well for you and your tween, or that was a disaster, please let us know in the comments.